At our Leatherneck Breakfast today detachment commandant, Dan Hudson, presented Susan Patrick with special-recognition from the President of the United States. Susan, a member of our detachment since 2016, performed 331 hours of volunteer service during fiscal-year 2017 and was recognized with the President's Volunteer Service Award. The award presentation included a silver medallion, a framed certificate, and a framed congratulatory letter from President Donald J. Trump. 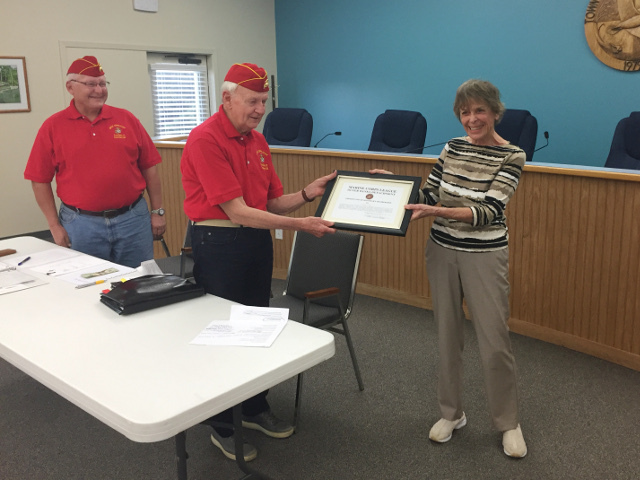 The members of the Outer Banks Detachment extend our congratulations to Susan for this stellar effort and encourage all to emulate her example of providing volunteer service to our community. Commandant Dan Hudson presented a Certificate of Appreciation on behalf of the members of the Outer Banks Detachment to Michael K. Manning in recognition of his successful efforts to return a Marine's dog tag that he recently found here on the Outer Banks. The presentation was made at our monthly breakfast social at the Jolly Roger in Kill Devil Hills with eleven of our members present. Mr. Manning's initiative, drive, and determination to locate and return this personal item speaks volumes of his character, are highly commendable, and are in keeping with the American virtues of patriotism and loyalty to our veterans. The Outer Banks Detachment was recently awarded a Department Meritorious Unit Commendation in recognition of its efforts in aiding the young daughter of two Marine parents who was seriously injured in a biking accident last year. Through the combined efforts of the detachments within the Department of North Carolina, over $8,500 was raised and donated to provide financial aide to assist the family in their time of urgent need. 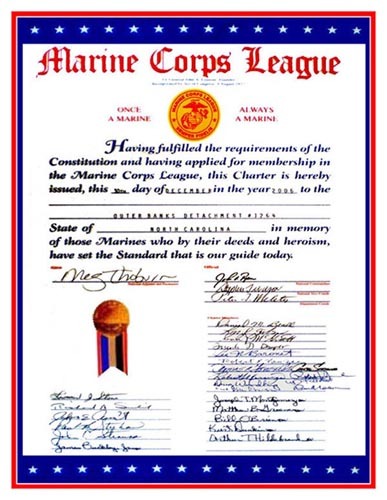 This action was recognized by the Marine Corps League Mideast Division with this citation as in keeping with the highest tradition of the Marine Corps League's founding principle of “Marines helping Marines.” This was the second such citation awarded to the Outer Banks Detachment since its charter in 2006 and authorizes the addition of a bronze star to the Department Meritorious Unit Commendation streamer. In addition, all those who were members of the Outer Banks Detachment between 23 June and 31 December 2017 are authorized to wear this award in recognition of the cited effort. 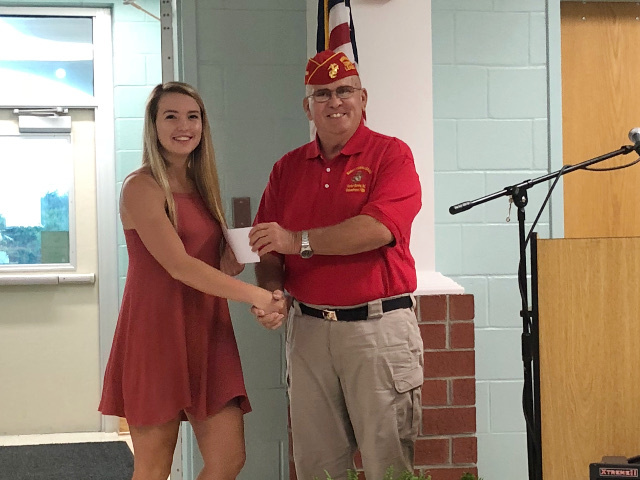 Savannah Scarborough, a 2018 graduate of Cape Hatteras Secondary School was awarded a $500 Good Citizenship Scholarship by members of the Marine Corps League Outer Banks Detachment at her school's awards ceremony this evening. Detachment Commandant, Dan Hudson presented Savannah with her scholarship along with the congratulations and best wishes for continued success on behalf of our membership. Savannah was selected for our scholarship based on the recommendation of the staff at her school in light of her service to her community. The Outer Banks Detachment presented a $500 grant to the Dare County Special Olympics at the opening ceremony of the 2018 Spring games today. Junior Past-Commandant Frank Draper, Adjutant Robert Yanacek, and Sergeant-at-Arms Michael Wartenbee presented the donation on behalf of the membership to Kathleen Morgan, the Dare County Special Olympics program coordinator. Kathleen extends her thanks to our detachment for their continued support of the Dare County Special Olympics. 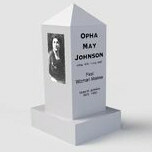 Members of the Outer Banks Detachment approved a $100 donation at this evening's meeting to the Woman Marine's Association to be used for a grave marker for the first woman Marine, Opah May Johnson. Opah enlisted into the Marine Corps in August 1918 and paved the way for thousands of other women to be able to serve as Marines through the current day. Sadly, she passed-away in 1955 and is buried in her family's plot in an unmarked grave at Saint Paul’s Rock Creek Cemetery in Washington DC. Our donation, along with donations from other detachments will undoubtedly be instrumental in ensuring that this brave woman's legacy is appropriately honored and remembered. 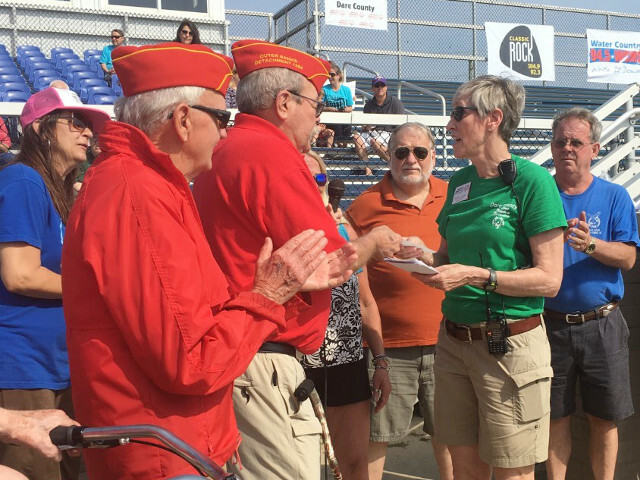 The Marine Corps League Outer Banks Detachment has been granted approval as a certifying organization for the President's Volunteer Service Award—a nationally recognized award that includes a congratulatory letter from the President of the United States. 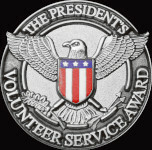 As the first certifying organization in eastern North Carolina authorized to present this award, the Outer Banks Detachment may now recognize those who perform volunteer service to our community with a President's Volunteer Service Award certificate and medallion, and a congratulatory letter from the President of the United States. Recognition with this award is based primarily on the number of hours of qualified volunteer service that an individual or group performs on an annual basis. As with other types of awards the detachment presents to recognize acts and deeds that promote and demonstrate patriotism, loyalty to our nation, and the American spirit of giving, this award is presented at no cost to the recipient. 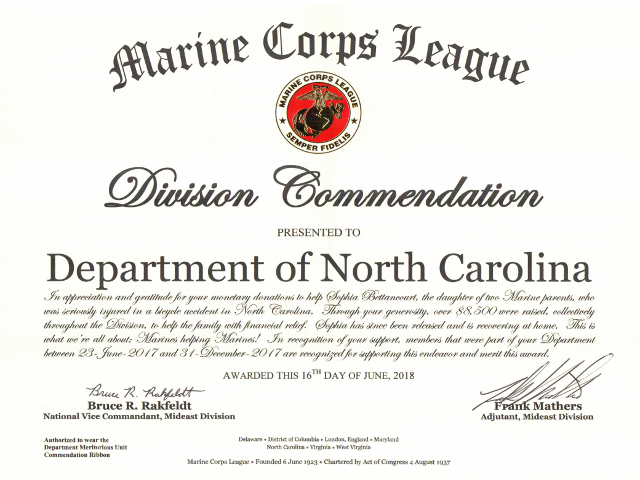 Persons or groups interested in working towards receiving this prestigious award are encouraged to contact the Marine Corps League Outer Banks Detachment for further details concerning the program. Members of the Outer Banks Detachment have decided to sponsor a local youth baseball team during their monthly meeting this evening. The team to be sponsored is part of the OBX Baseball League and will consist of 13 to 15 year olds with their games being played in Kitty Hawk and Kill Devil Hills. This decision is yet another example of the willingness of our members to support worthwhile local organizations. Although the teams have not yet been formed, nor the schedule set, play will begin during the latter part of June. The Outer Banks Detachment installed its newly-elected staff members at its meeting today. Administering the oath of office was Department of North Carolina Eastern Sector Junior Vice-Commandant Stephen Tracy. Those installed were: Daniel R. Hudson as commandant; Oyoma R. Bowser as junior vice-commandant, and; Russell E. Laney as judge advocate. These newly-installed members will serve in their designated billets for a period of two years. In addition to the elected staff billets, those serving in appointed offices were installed in the same ceremony. Those installed in appointed offices were: Robert J. Yanacek as adjutant; Richard Lawrenson as chaplain; Jorge L. Diaz as paymaster, and Dennis R. Thompson as quartermaster. Members serving in appointed billets serve for an unspecified period, at the pleasure of the detachment commandant. 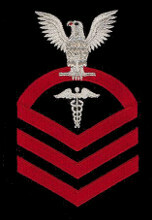 At the completion of the ceremony, Frank D. Draper assumed the duties as the detachment’s junior past-commandant as prescribed in the bylaws. Biographies for each staff member is provided at the link below. 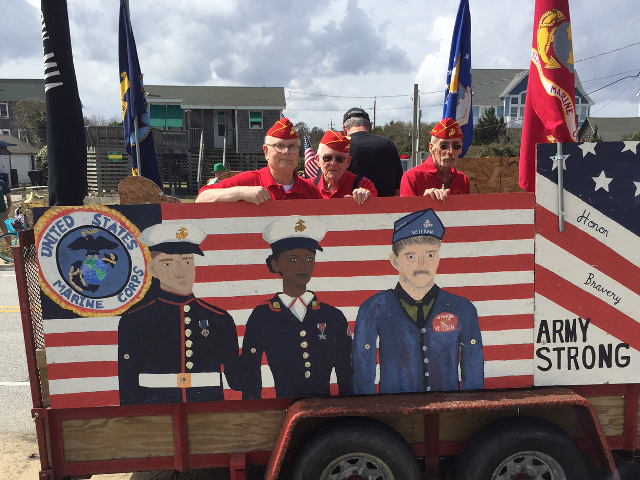 The Marine Corps League Outer Banks Detachment's Toys for Tots campaign set a new record in 2017, purchasing 5,336 toys and distributing them to 1,287 children in Dare and Currituck counties, according to the detachment's Toys for Tots Liaison, Larry Czernik. Although this year had been challenging by the addition of Currituck County to our area of operations, our Marines once again met that challenge and exceeded our goals. This however, could not have been done without those who supported or efforts through their generous donations. We wish to extend our gratitude, to all who made this past Christmas a joyous one for so many local children. The Outer Banks Detachment recently acquired a brand-new 7.5-foot Christmas tree courtesy of our friends at the Kitty Hawk Walmart, and in the spirit of giving, donated it to a lucky family here on the Outer Banks. The tree was offered to any family in need through the OBX Locals Facebook page with the hope of reaching out to our community to spread the joy of Christmas. A detachment member then delivered the tree to the home of the lucky recipient with the wishes for a Merry Christmas and a healthy and happy New Year on behalf of our Marines. The Outer Banks Detachment presented a $500 check to the Dare County Special Olympics at the opening ceremony of the 2017 Spring games today. Commandant Frank Draper, Junior Vice-Commandant Michael Keating, and John Dozier presented the donation on behalf of the membership to Kathleen Morgan, the Dare County Special Olympics program coordinator. Kathleen extends her thanks to our detachment for their continued support of the Dare County Special Olympics. 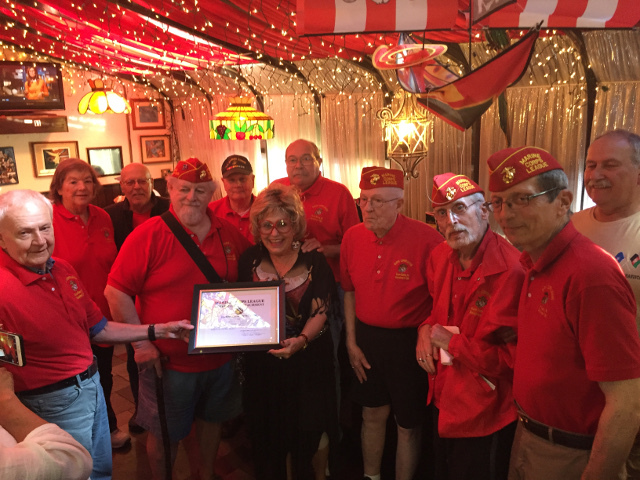 Commandant Frank Draper granted honorary membership to Joanne Sulik today on behalf of the members of the Outer Banks Detachment in recognition of the courteous and expertly-performed embroidery services she has provided to the Marines of the Outer Banks Detachment for the period 1 January 2007 through 28 February 2017. Her efforts have been both noteworthy and instrumental in developing a sense of esprit-de-corps among our members, and further serves as evidence of her commitment to the Outer Banks Detachment and as an example for others to emulate, earning her the respect and admiration of our members. 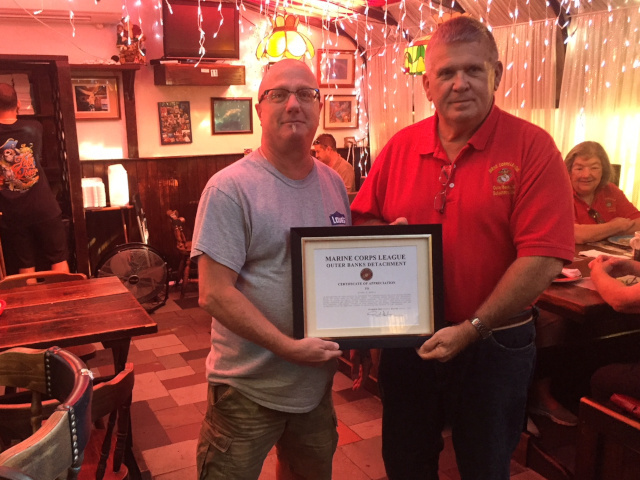 Commandant Frank Draper presented a Certificate of Appreciation on behalf of the members of the Outer Banks Detachment to Carol Ann Angelos and the staff of the Jolly Roger Restaurant in recognition of the timely, courteous, and friendly service they have extended to the Marines of the Outer Banks Detachment while hosting our monthly breakfast social events for the period 7 October 2014 through 7 March 2017. The professionalism they have demonstrated is truly noteworthy, has positively impacted on the members of our detachment, and serves as a testimony of their commitment towards the veterans of the Outer Banks community. Members of the Outer Banks Detachment voted today to participate in the Surfrider Foundation's Adopt-A-Beach program and have adopted the West Third Street Estuarine Access in Kill Devil Hills. 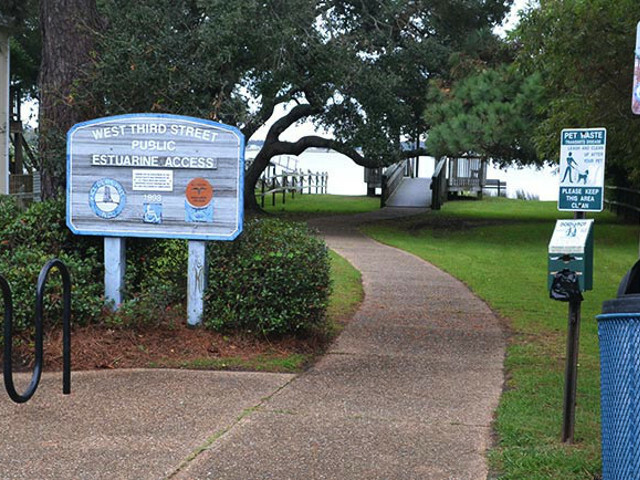 The Outer Banks Detachment has assumed the responsibility of maintaining this access and will conduct cleanup activities a minimum of six times per year. In a unanimous decision, detachment members have once again committed to giving back to our community and making it a better place through participation in this program. The members of the Outer Banks Detachment recently approved a donation of $200 to the Corpsmen Memorial Foundation in Jacksonville, North Carolina at their January business meeting. The donated funds will be used by the foundation to construct a memorial to the thousands of Navy Corpsmen who have served along side Marines, often risking and sacrificing their own lives under fire to aid injured and wounded Marines. The Corpsmen Memorial Foundation is attempting to raise $450,000 for the construction of the memorial, that will be displayed at Camp Johnson, North Carolina. They are approximately one-third of the way towards that goal. The members of the Outer Banks Detachment are proud to be a part of this worthwhile effort as a way of remembering and thanking our brothers who didn't hesitate at the dreaded call, "Corpsman Up!" 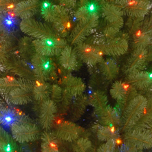 The Outer Banks Detachment recently acquired five brand-new Christmas trees courtesy of our friends at the Kitty Hawk Walmart, and in the spirit of giving, donated them them to five lucky families here on the Outer Banks. The trees, ranging in size from 6.5 to 9-feet, were offered to any family in need through the OBX Locals Facebook page with the hope of reaching out to our community to spread the joy of Christmas. A detachment member then delivered the trees to the homes of five lucky recipients with the wishes for a Merry Christmas and a healthy and happy New Year on behalf of our Marines. Today, the Outer Banks Detachment completed the 2016 Fall Belk Charity Day Sale, and it was once again a great success! During the sale, members of our detachment raised over $1,090 that will be used to support the various local veterans’ and charity programs which includes the Dare County Toys for Tots program and the Dare County Special Olympics. We thank those members who participated in this effort, and to the public for their generous support. 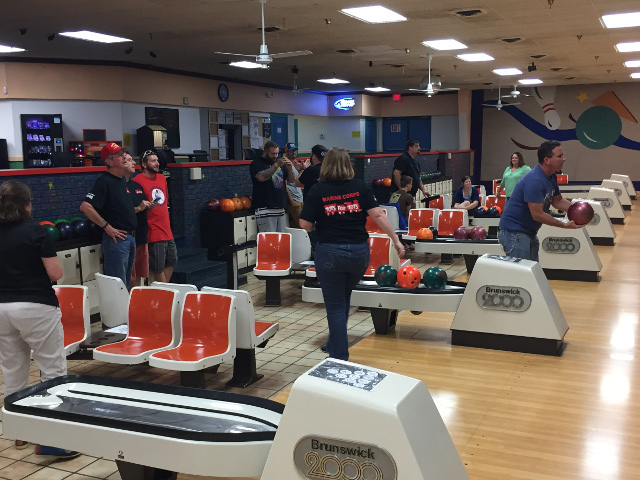 The 2016 Toys for Tots campaign began this evening with about twenty people attending a "Bowling for Tots" event, sponsored in-part by the the Outer Banks Bowling Center in Nags Head. Those participating enjoyed bowling at a reduced rate per game following their admission to the event with a toy donation. Outer Banks Detachment Toys for Toys liaison, Larry Czernik, reported the event was successful and resulted in one collection-box of toys that will be distributed to the children of Dare County this Christmas. We extend our thanks to those who participated in this event. Eight members of the Outer Banks Detachment participated in the 2016 Outer Banks Seafood Festival today in Nags Head. The event drew a large crown and our members took this opportunity to inform the public as to our local community service efforts which included our 2016 Toys for Tots campaign. This message was well-received and the detachment collected over $650 towards this worthy cause. 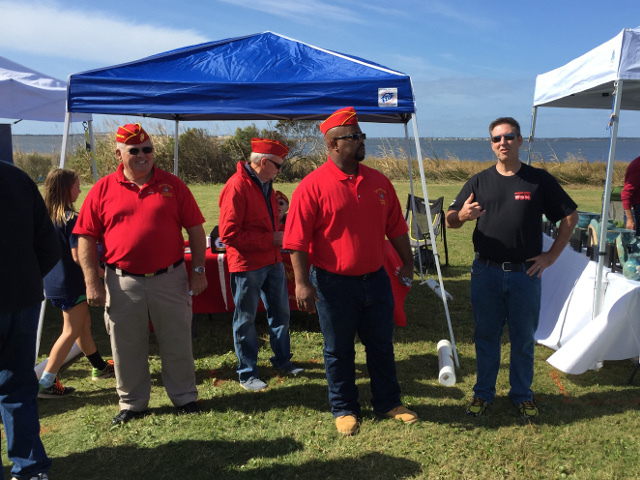 In addition, our members enjoyed interacting with the those who attended and were very pleased to identify a number of candidates who expressed interest in joining the ranks of the Outer Banks Detachment. We express our gratitude to the generosity of those who contributed to our efforts in making the upcoming Christmas more joyful to children of Dare County, and look forward to seeing our fellow-residents at events in the future! The annual Toys for Tots campaign in Dare County will kick-off on Monday October 17, 2016 with a bowling night, sponsored in-part by the the Outer Banks Bowling Center in Nags Head. Those desiring to attend should bring a new, unwrapped toy, valued at $10 or more to gain admission to the event. Admission will entitle the donor to at a reduced rate of $2.25 per game from 7 to 10PM the evening of the event. Detachment members and the general public are invited to attend to enjoy an evening of fun while supporting this worthwhile cause. For further details and current information on this event, visit the Dare County Toys for Tots Facebook page. The Marine Corps League Outer Banks Detachment began their annual Toys for Tots campaign today by donating $1,000 to the Dare County Toys for Tots chapter. This donation will be used to purchase toys for needy children in our county this year with the goal of helping the less fortunate youngsters in our area experience the joy of Christmas. In addition to this donation, members of the detachment will also be collecting toys at various locations throughout Dare County, and will be collecting both toys and donations from the public at the Kitty Hawk Walmart on weekends from mid-November through mid-December. Marines from the Outer Banks Detachment will be participating in the 2016 Outer Banks Seafood Festival reported detachment commandant, Frank Draper. This annual event is one of the best-attended events on the Outer Banks, and as such, our members will be there letting those in our community know of our local efforts. 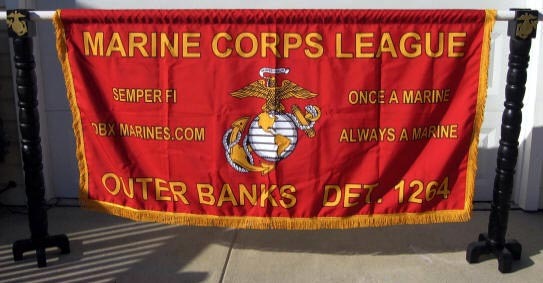 In addition to providing information to the general public about our community efforts, members of the detachment will be seeking to identify those with honorable Marine Corps or Fleet Marine Force service to join the detachment’s ranks, and to accept donations necessary to fund the detachment’s various community service programs, including Toys for Tots and a number of Americanism programs. The Outer Banks Detachment is one of only fifteen non-profit organizations authorized to participate in this year’s event, which will be held on October 15, 2016 from 10:30AM until 6:00PM. Further information about the Outer Banks Seafood Festival may be obtained at the link below. The Outer Banks Detachment participated in and completed the 2016 Spring Belk Charity Day Sale today, and it was once again a great success! During the sale, members of our detachment raised over $1,650 in funds that will be used to support the various veterans’ and charity programs that we participate in each year. We extend our thanks to those members who participated in this effort, and to the public for your generous support. 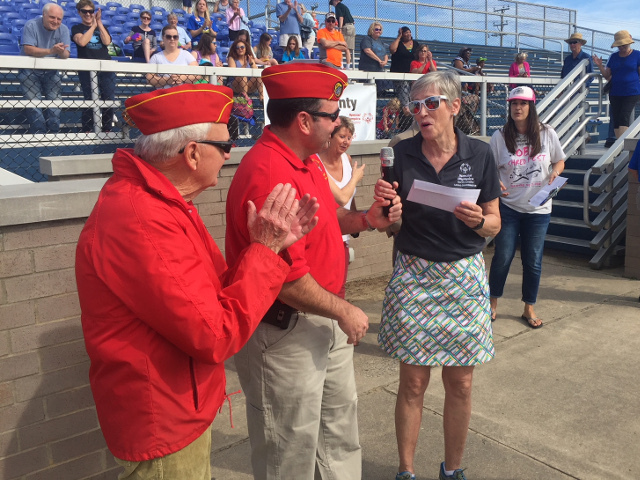 Outer Banks Detachment Commandant Frank Draper and Senior Vice-Commandant Michael Keating presented a $300 grant check to the Dare County Special Olympics at the opening ceremony of the fifth annual Spring Games today. In addition to that, a personal donation by a member of the detachment of $50 was also presented by Commandant Draper and Junior Vice-Commandant Keating. Graciously accepting these donations on behalf of the Dare County Special Olympics was the program’s local coordinator, Kathleen Morgan. Kathleen extended her appreciation to our detachment for their generosity and plans to utilize our gift for the athlete’s uniforms for next year’s games. 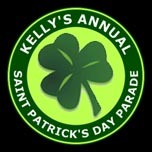 On 13 March 2016 members of the Outer Banks Detachment participated in the 27th Annual Kelly's Saint Patrick's Day Parade in Nags Head. The detachment lead the mile-length parade in conjunction with our local VFW and American Legion posts. Those participating in this event had a great time and enjoyed the best weather the parade has experienced in many years. The parade was viewed by an estimated 10,000 spectators who extended their appreciation to our veterans through applause and verbal expressions of thanks. Members who participated in the parade were: John Dozier; Dennis Thompson; Dan Hudson; Russ Laney; Ray Bowser; Cory Lotspeich; Craig Clark; Tim Gregory, and; Robert Yanacek. The Outer Banks Detachment installed its newly-elected staff members today. Administering the oath of office was Timothy G. Gregory who had served the past two years as the detachment’s commandant. Those installed were: Frank D. Draper as commandant; Daniel R. Hudson as senior vice-commandant; Michael A. Keating as junior vice-commandant, and; Russell E. Laney as judge advocate. These newly-installed members will serve in their designated billets for a period of two years. In addition to the elected staff billets, those serving in appointed offices were installed in the same ceremony. Those installed in appointed offices were: Robert J. Yanacek as adjutant; Richard Lawrenson as chaplain; Jorge L. Diaz as paymaster; Dennis R. Thompson as quartermaster; Craig T. Clark as sergeant-at-arms, and; Lawrence C. Czernik as Toys for Tots liaison. Members serving in appointed billets serve for an unspecified period, at the pleasure of the detachment commandant. At the completion of the ceremony, Timothy G. Gregory assumed the duties as the detachment’s junior past-commandant as prescribed in the bylaws. Biographies for each staff member is provided at the link below. The Marine Corps League Outer Banks Detachment thanks all of Dare County for their outstanding support of this year's Toys for Tots campaign. To all of the people who generously donated toys, time, effort and money: Thank You. We would like to thank and acknowledge the wonderful support given by the following organizations and businesses: Ace Hardware Kitty Hawk; Ace Hardware Manteo; Blue Moon Beach Grill; Blue Water Grill; CVS Manteo; Duck Thru Wanchese; Duck Woods Country Club; Gift Garden; Lucky 12 Tavern; Manteo High School; Monkey Business; Mystic Antiques; Nags Head Self Storage; Outer Banks Heating and Cooling; Outer Banks Association of Realtors; Outer Banks Hospital, Pirates and Pixies; Print Plus; Roanoke Island Garden Club; Southern Shores Fire Department; Southern Shores Police Department; Southern Shores Town Hall; Walgreens, and; Walmart. Also, a special thanks to the Baum Center staff, the Dare Community Center staff and the Outer Banks Woman's Club for their tireless efforts in sorting and distributing toys. Detachment commandant, Tim Gregory recently appointed Jorge Diaz as the detachment's paymaster to replace Bob Messinger who is stepping down from that position after serving nine years in that billet. Members serving in appointed billets serve at the pleasure of the detachment commandant. We extend our congratulations to Jorge on his appointment, and our thanks to Bob for his faithful and honorable service. 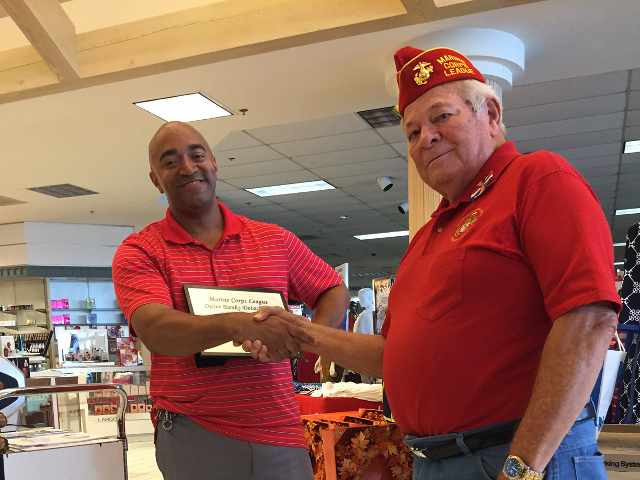 The Outer Banks Detachment recently presented Charles Lewis, general manager of the Kill Devil Hills Belk store with a Certificate of Appreciation in recognition of his continued support to our detachment's fundraising efforts through the Belk Charity Day Sales. 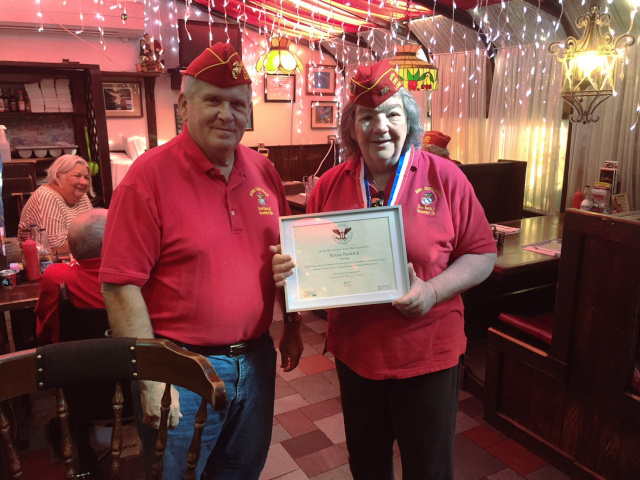 The certificate was presented on behalf of our detachment by paymaster, Bob Messinger. With Charles' support, the Outer Banks Detachment has raised over $8,200 since we began participating in 2011. 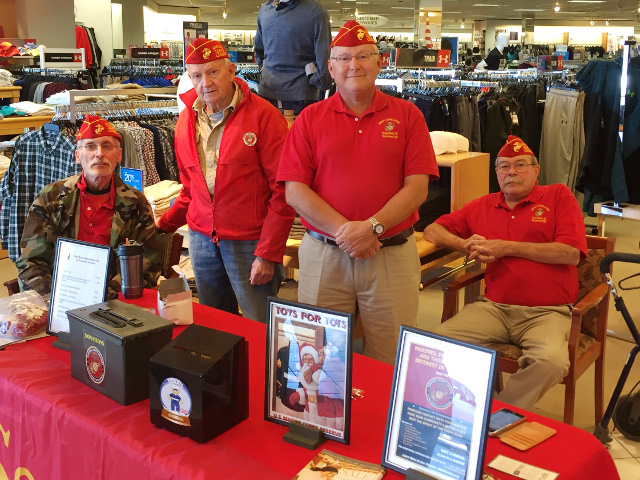 The Outer Banks Detachment participated once again in the Spring Belk Charity Day Sale and it was once again a great success! During the sale, we raised over $1,100 in funds that will go towards the support of various veterans' and charity programs that we participate in each year. A hearty well-done to those who assisted us in our efforts. 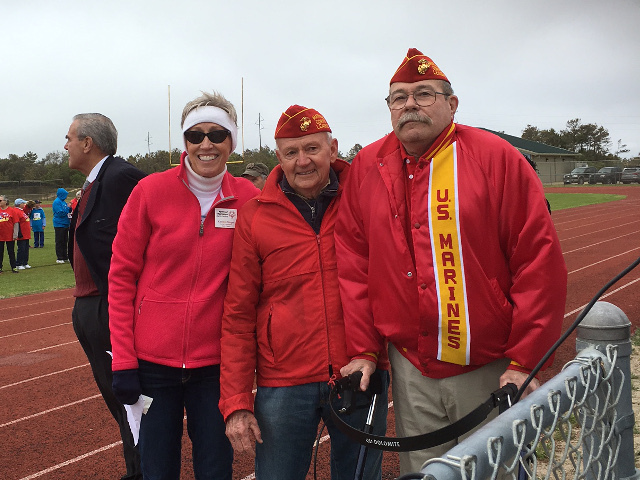 Local Marines of the Marine Corps League Outer Banks Detachment recently received a $500 grant from the Walmart Foundation. This grant was awarded under the provisions of Walmart’s “Volunteerism Always Pays” program and was presented on behalf of the foundation by the Kitty Hawk Walmart store general manager, Turner Thompson. Thompson explained that the “Volunteerism Always Pays” program was implemented by the Walmart Foundation as a means of encouraging Walmart employees to perform volunteer service to local non-profit organizations. Grants through this program are awarded by the foundation quarterly, based on the number of hours of volunteer service performed by Walmart employees on behalf of qualifying organizations. Currently the Marine Corps League Outer Banks Detachment has two members on its rolls who are employees of our local Walmart store. In addition to this program, Thompson explained that the Walmart Foundation makes available other grants, and annually awards over 18 million dollars to non-profit organizations throughout the nation. 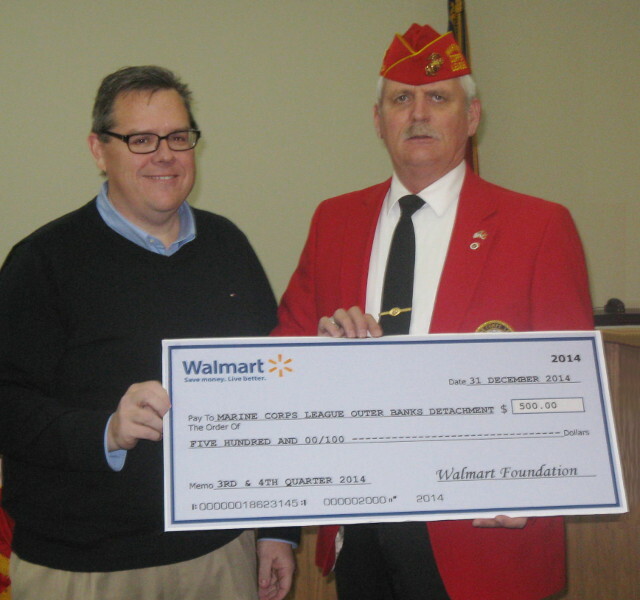 “This past year non-profit organizations in our area received over $25,000 in grants from the Walmart Foundation to assist them in their efforts,” he added. Thompson then briefed the detachment’s membership on Walmart’s active effort of hiring veterans, explaining that hiring veterans is one of the best decisions a company can make. Veterans, he continued, already possess the attributes of discipline and commitment, as well as the ability to learn quickly and work together as a team. “They have already proven themselves and they help us to build a better business by providing excellent service to our customers,” he added. Walmart’s effort in supporting veterans also extends to military spouses through their Military Family Promise program. This program guarantees military personnel and their spouses who are employed at Walmart, a job at a nearby store should they relocate to a new area in connection with orders issued by the United States military. The Kitty Hawk Walmart currently employs four prior-service Marines in addition to others who have served honorably in the Army, Navy, Air Force, and Coast Guard. Those in attendance were then informed by Thompson of two recent initiatives that will help them, and all customers, save even more money when shopping at Walmart. “Walmart matches prices from our local competitors, and is now matching prices from walmart.com and other online retailers.” This price matching policy is performed at any register when checking-out by the customer simply presenting evidence of an identical online in-stock item displaying the price and retailer. Evidence may be presented to the cashier by means of a printed copy or by simply displaying the required information on a mobile device. An even more exciting and easier way to save money is through the use of a Walmart-developed application called “Savings Catcher.” Savings Catcher was implemented this past July and automatically searches for lower local prices on the items purchased by our customers, Thompson explained. Customers only need to enter in their receipt number and purchase date into the Savings Catcher application, which can be done on any mobile or desktop device. Savings Catcher will then do the rest by comparing what the customer paid for each item at Walmart against prices for the same items advertised by local competitors. Once Savings Catcher locates a lower price, it automatically refunds the difference to the user’s account by generating an e-gift card that can be redeemed on future purchases at any Walmart store. “The annual savings potential by using this application can save any customer hundreds of dollars or more over Walmart’s already low prices,” Thompson added. Following Thompson’s presentation, Outer Banks Detachment commandant, Tim Gregory, presented him with a Certificate of Appreciation on behalf of the membership in recognition of his efforts as a guest speaker at the meeting, and for his diligence in ensuring that our nation’s flag is properly and respectfully displayed at his store in Kitty Hawk. Detachment commandant, Tim Gregory recently appointed member Craig T. Clark to the billet of detachment Sergeant-at-Arms. Those appointed to this billet serve at the pleasure of the detachment commandant. We extend our congratulations to Craig on his appointment and are certain that he will be a valuable asset to our detachment staff. Detachment commandant, Tim Gregory recently made two appointments to fill staff billet vacancies. Appointed as adjutant was charter-member Robert J. Yanacek, and appointed as the detachment's public affairs officer was Michael A. Keating. Members in these billets serve at the pleasure of the detachment commandant. We extend our congratulations to these newly appointed members and are certain that both will be a valuable asset to our detachment staff. A newly designed recruiting poster is available on-line for members to download, print, and place at strategic locations in the Outer Banks area. Getting the word out about our detachment to our fellow Marines is vital to our organization and its mission of fellowship and service to our community. Posters provide an excellent means to assist us in locating and inviting our comrades to become members of our detachment. In addition, each poster makes the general public aware of our presence and our commitment to our local community. We ask that every member print and post at least two posters in locations frequented by local residents. Those visiting our website on mobile devices will now be automatically re-directed to a new mobile version in order to simplify and enhance the viewing experience. The new mobile version is fully functional and was developed and implemented by our webmaster. It is now available to those accessing the site with smart phone devices. Those visiting the mobile version of our website also have the option to switch back to our standard desktop website by clicking on the "Desktop Site" button at the bottom left of any mobile website page. Qualified North Carolina military veterans are now able to carry the designation “VETERAN” on their driver licenses and identification cards. Thanks to a law passed by the General Assembly, veterans who have been honorably discharged from the U.S. Armed Forces who present their DD-214 discharge form can apply at a driver license office for the new designation. Thomas, NCDOT Secretary Tony Tata, legislative members, and representatives of the state’s Veterans Affairs Office and the N.C. Retail Merchants Association kicked off the launch of the new “VETERAN” designation in March at the N.C. Museum of History before an exhibit about North Carolina service members. Military veterans requested the designation to assist them in obtain military discounts from a wide variety of retailers and service providers without having to show their military discharge form. Putting the designation on the driver license or ID card enables the state’s veterans to show their photo ID and their veteran status at the same time. Many states are making such designations available. The Jolly Roger Restaurant is offering a FREE breakfast to our local veterans the first Tuesday of each month. Simply present your military ID card or your Dare County Veterans ID card to receive your free breakfast. Breakfast is served from 0630 to 1400 and consists of two eggs prepared the way you like them, toast, and either home fries or grits. The Jolly Roger is located on the beach road at 1836 North Virginia Dare Trail in Kill Devil Hills. For further details, you may contact the Jolly Roger at 252-441-6530. Read about our detachment's past news events of significant importance to our history of service to the community and camaraderie towards our fellow members.